Dr. Ikeda started research on what was responsible for the taste in kelp. He discovered that glutamate was a key component of the soup stock from kelp (kombu in Japanese) and called this new taste “umami” which is also known in English as savory taste. Dr. Ikeda succeeded in transforming glutamate from kelp into an easy-to-use seasoning that was rich in the umami taste. Professor Ikeda decided to make a seasoning using his newly-isolated and distinctive-tasting ingredient. To be used as seasoning, glutamic acid had to have some of the same physical characteristics of sugar and salt: it had to be easily soluble in water but neither absorb humidity nor solidify. Professor Ikeda found that monosodium glutamate, a salt that contains glutamate and sodium, had good storage properties and a strong umami taste (savory taste). It turned out to be an ideal seasoning. Because monosodium glutamate, abbreviated MSG, has no smell or specific texture of its own, it can be used in many different dishes where it naturally enhances the original flavor of the food. Download a translation of Professor Ikeda’s original paper on the discovery of umami below. Like salt, glutamate can make a variety of foods more appealing, but is not itself particularly palatable. If you dissolve monosodium glutamate in water, it does not have an appealing taste. 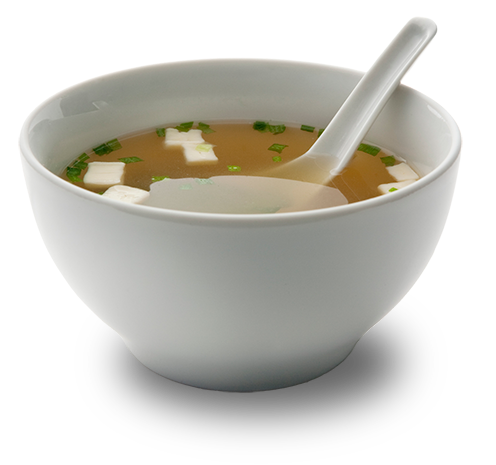 However, when it is added to soup, it improves many aspects, including taste, mouthfeel and smoothness.